ImageMeter can synchronize the images stored on your devices with cloud storage. You can use this for backup or to mirror the images on several devices. ImageMeter supports several cloud storage providers, e.g. Google Drive, Dropbox, or any WebDAV compliant server like Nextcloud or Owncloud. ImageMeter does not come with its own cloud storage, but instead supports many popular storage providers. On some providers (Google Drive and Dropbox), you can simply select your account when you sign in, but you have to install the respective vendor app first, because it processes the authorization. 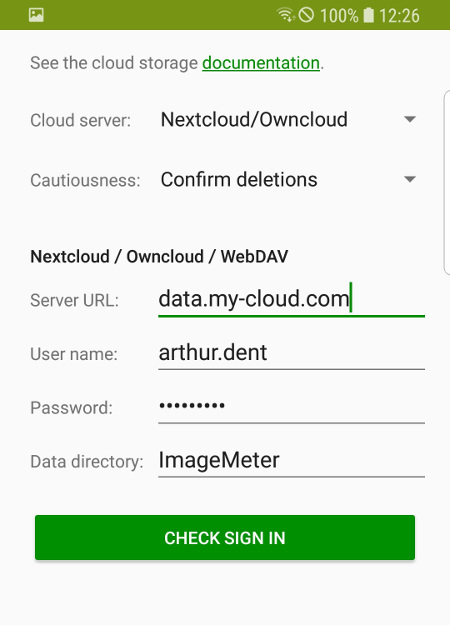 When using a WebDAV-compliant server (like Nextcloud or Owncloud), you have to enter the server URL, username and password. ImageMeter will by default try to connect with 'https', but you can also user plain 'http' URLs by explicitly writing 'http://' in front of the server URL. Moreover, you have to specify a data directory into which ImageMeter will place all its data. Use a dedicated directory for this purpose (e.g. the default directory name 'ImageMeter') as ImageMeter will control all data in this directory. While you can move data into and out of this directory manually too, we do not recommend modifying the files, as you may leave the files in an inconsistent state and render them unreadable. Connecting to a Google Drive account. Connecting to a Nextcloud server. To start synchronization of your images on the device with the cloud storage, use the respective menu item on the main screen. Usually, synchronization is completely automatic and no user-interaction is required. However, ImageMeter is very cautious about your data and may ask your for advice, when it discovers a possibly dangerous situation. For example, after you deleted an image on your mobile device, it may ask you whether you really want to also delete the server copy. If you deleted the local image accidentally, you can alternatively download it again from the server backup instead of deleting that copy too. A further case is when you use several mobile devices and you mirror the data onto both devices. In this case, it may happen that the same image is modified on both devices. During synchronization, ImageMeter may then ask you which of these two versions to keep. Never ask - ImageMeter will perform all synchronization completely automatic. If a file is deleted locally, it will also be deleted on the server, and vice versa. If an image has been modified on two devices, the latest change wins. Confirm deletions - ImageMeter will ask for confirmation before it deletes any images. Confirm conflicts and deletions - ImageMeter also asks when there are two versions of an image with conflicting changes. Confirm everything - Asks the user to confirm every change, even if these have no conflicts and no data will be deleted. 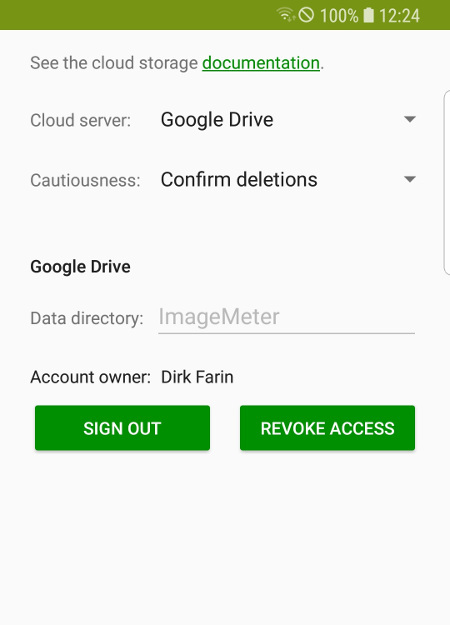 When ImageMeter asks for confirmation, it will show the images that will be deleted or which have conflicting modifications. It will also propose for each image what it thinks is the best action to handle this. However, you can select and alternative action. For example, if you accidentally deleted an image, you can restore it from the server instead of deleting it also on the server. 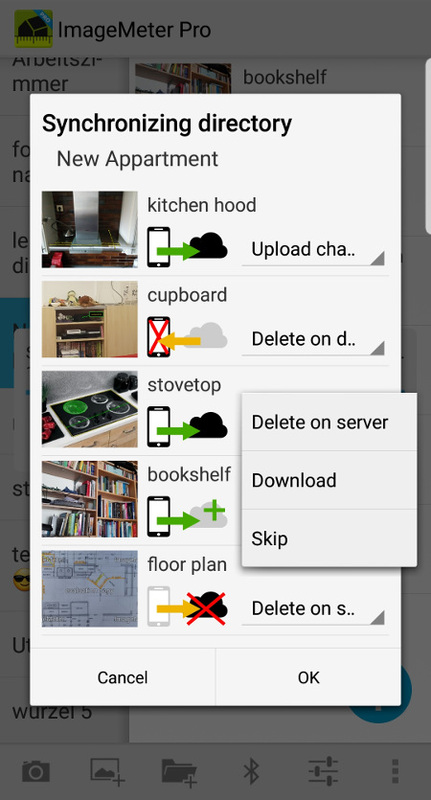 You can connect to the same directory from several devices to mirror your data, but it is currently not possible to create a shared folder that can be accessed from several accounts. If you want to share the data between several devices, you have to use the same Google account on them. ImageMeter is asking for full access to your Dropbox account. Still, it only accesses the data in the storage directory that you specified. Full access is required to be able to create a shared folder that can then be accesses by several accounts. This way, you can mirror the data with your colleagues even when each uses a different Dropbox account. In order to share data with your colleagues, each having their own account, you can create a shared folder that you then use as the ImageMeter data directory. Now, back on the main screen of ImageMeter, click on the Bluetooth icon. It will start to blink, indicating that it is now trying to connect to the distance meter. If this is the first connection between the devices, ImageMeter will start a pairing request. When the connection is successfully established, the icon will turn blue and we are ready to go. If it does not work, check again that there is no other app blocking the connection and that the correct device was selected in the settings. In very rare cases, you may need to restart the distance meter or your Android device.